Does your spouse tell you your snoring sounds more like a chainsaw? Has he or she said that your snoring suddenly and frequently stops during the night, and that you then choke or gasp for breath? If so, you may be one of the millions of Americans who suffer from obstructive sleep apnea, a condition in which a narrowing of the upper airway causes people to stop breathing for 10 to 30 seconds at a time while they're sleeping. These breathless episodes can occur up to 100 times an hour - even though you may not wake up enough to realize that they've happened. They may leave you feeling sleepy, irritable and unable to concentrate during the day without knowing why. If you are diagnosed with obstructive sleep apnea, your treatment may include CPAP or Bi-Pap therapy. These non-invasive therapies have been proven effective in restoring sleep quality and reducing symptoms of sleep apnea. 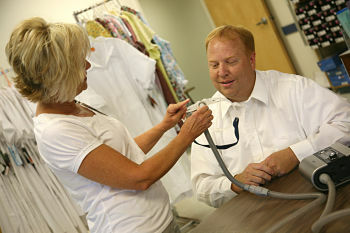 To help those affected by sleep apnea, Salem Home Medical carries a complete line of CPAP and Bi-Pap equipment. Our staff of respiratory therapists is available to counsel patients on the proper use of the equipment, provide support and answer any questions you may have. To learn more, call Salem Home Medical at 330-337-9922.